We’d like to recognize the incredible work of the men and women of Danella who work in storm restoration and shine a light on the work they do to keep our communities up and running. We talked with Joseph Spause, who is the Vice President of Danella Construction of Pennsylvania, New Jersey, and oversees storm restoration. Danella’s power restoration work is done when storms take out power lines, or when downed trees fall on utility poles. The storm response team is mobilized to reset the poles and restore the electrical lines. 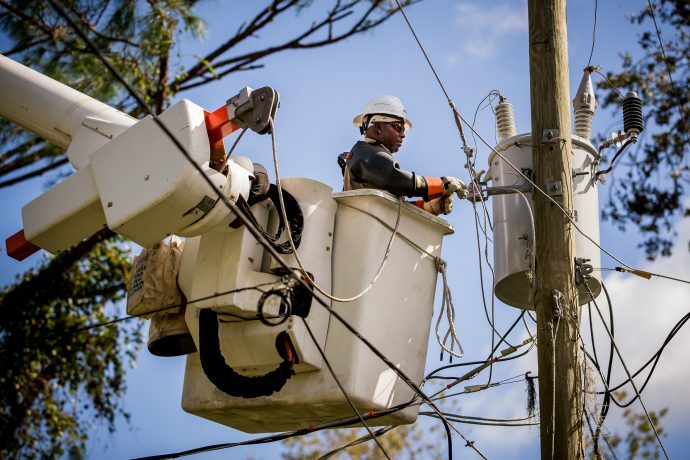 Power restoration is done on behalf of utility companies. It can be a dangerous line of work, which is why Danella’s storm restoration teams are always made up of the best that the industry has to offer. They never cut corners and always put safety first. The last few years have seen an uptick in hurricane activity. Danella was recently in the Carolinas responding to hurricane Michael, and last year responded to hurricanes Irma and Matthew in the Florida region. Storm response teams work 16-hour days, 7 days a week until power is restored. Sometimes the job takes one day, and sometimes it takes weeks while the team sleeps on cots or in emergency shelters. Our teams mobilize wherever a storm hits, be it Philadelphia or California. We want to thank our response teams for dedicating themselves wholeheartedly to our communities when they are most in need.